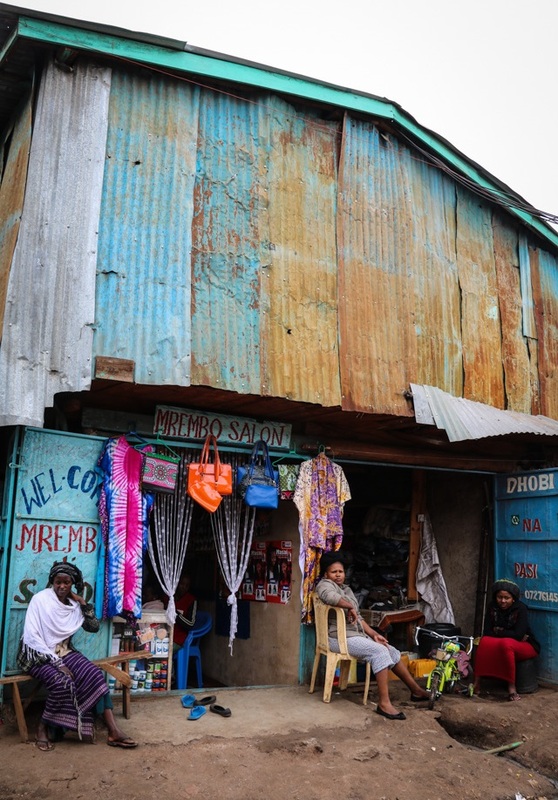 Wrapping your head around Kibera is no easy task. 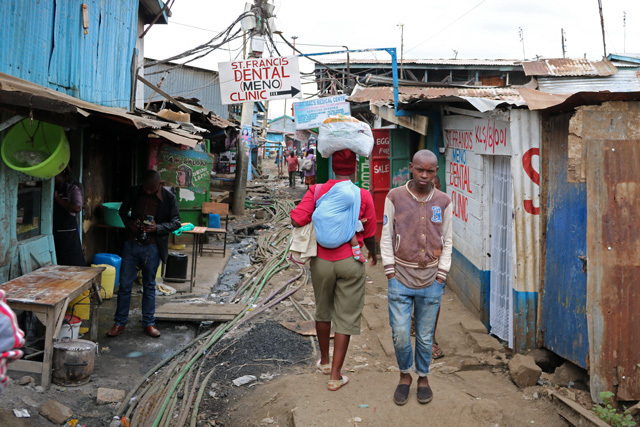 This Nairobi neighborhood is home to more than a quarter of a million people who live in an area smaller than New York’s Central Park. Most residents lack affordable access to core city services. Reliable electricity, clean water, sanitation and healthcare are similarly out of reach for many.While living conditions are improving in some areas, development efforts have not been without controversy. 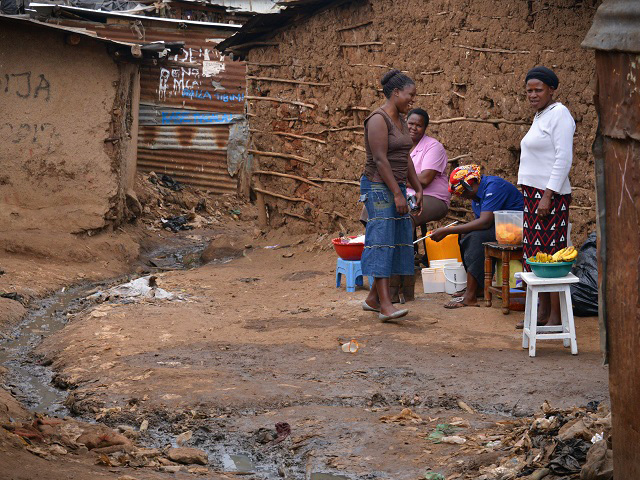 Kibera residents often don’t have a voice in development, a common issue in fast-growing cities. 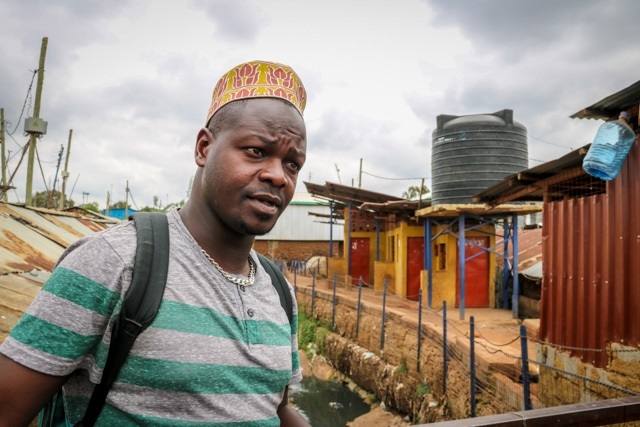 We visited Kibera with the Kounkuey Design Initiative (KDI), a nonprofit that swims against this current. KDI’s 16-person team works directly with community groups to redesign and reclaim public spaces for productive use. KDI has completed 10 projects ranging from drains to schools, all with a public space component. 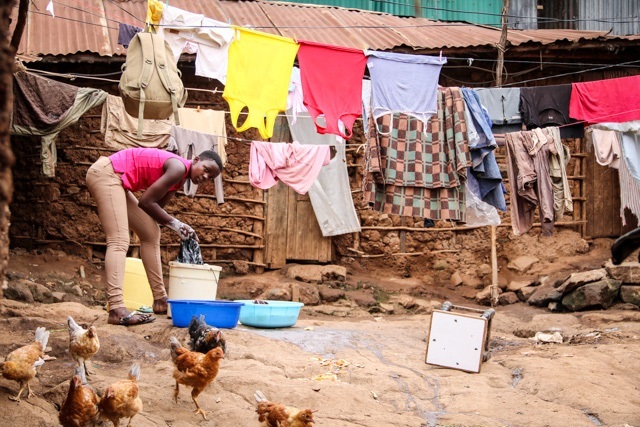 Kibera is composed of 13 villages on land technically owned by the government, yet some groups claim historical land rights dating back to the colonial era, while others hold official building permits dating back to the 1970s. Most residents are renters. Without clear regulations, landlords have little incentive to improve living conditions, since they collect high rents regardless of the service provided. To meet the relatively high cost of living compared to their incomes, residents share tiny living areas. The average shack houses eight people in a 12 foot by 12 foot space. As open space disappears, owners are increasingly going vertical, with second stories cropping up across the skyline. Many household activities, like washing clothes, spill into the small open spaces left. But these areas often lack proper drainage, sanitation, clean water supplies, electricity and comfortable spaces for social gathering. Without a fully functioning solid waste collection system or permeable green spaces, the neighborhood is still prone to flooding. Over the past 10 years, the central government has initiated a number of housing and infrastructure upgrading projects. Formal services, from water lines to paved roads, are now available in some parts of Kibera. But larger development projects, led by stakeholders from outside the community, often pay little attention to meeting current residents’ needs and reducing vulnerability. For example, these homes will soon be demolished to make room for a large highway. 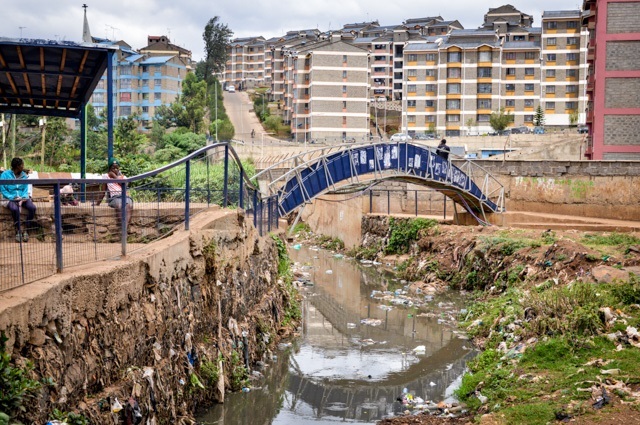 The project will likely bring benefits to the city, but there has been limited consultation with the community on how the new roadway might support development in Kibera. One of KDI’s overarching goals is to create a series of linked spaces that make the neighborhood more resilient, particularly to flooding. We wanted to understand how they have navigated the complexity of the neighborhood, and how their model differs from traditional approaches to slum upgrading. 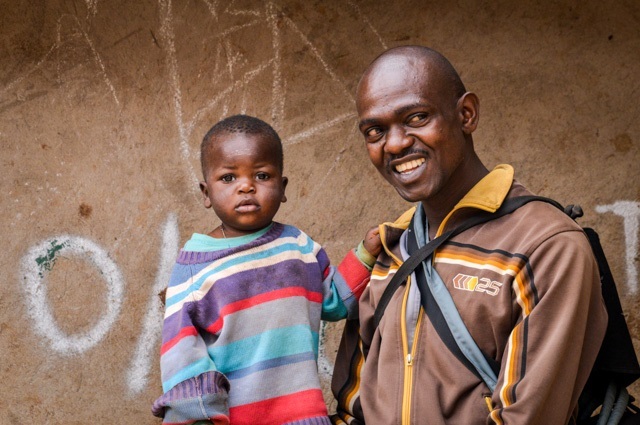 Pascal Kipkemboi, community coordinator at KDI, is from the neighborhood and an expert in community engagement. He explained that projects like the playground, toilets, water vending and recycling site behind him are the result of rounds of proposals, applications, site visits and community discussions. Making this project a reality required shoring up the river bank to reduce flooding and improve water flow through the neighborhood. KDI’s approach is similar to acupuncture relieving pressure points in the built form of the neighborhood. One example is a bridge that improved general neighborhood access and safety as well as reduced flooding risks. 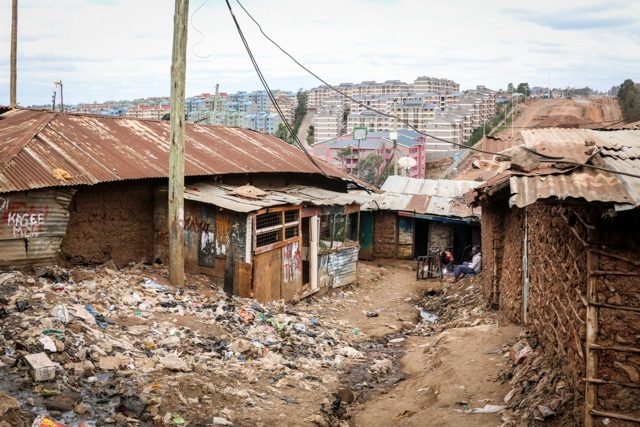 Here, the slums of Kibera stand in stark contrast to the new, mid-rise apartment complex the government is building—only the bridge connects the two worlds. Evans Somba, a community associate, ensures that each project reflects the needs and desires of the neighborhood. The more democratic process takes months, but “the longer the process, the more it reflects the needs of the population and the more long-lasting it will be,” said one team member. One need KDI surfaced: clean, serviced and safe spaces for gathering and household chores. This project converted a flood-prone area into an active community space. For 5 Kenyan shillings (about $.05) that go to a non-profit run by the neighborhood, people can wash their clothing, take a quick shower or use the toilet. 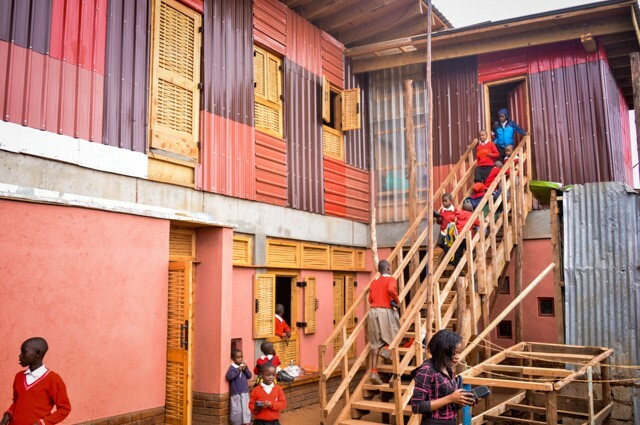 KDI worked with one community to rebuild an informal school, Anwa Junior Academy. KDI partnered with an education non-profit, Dignitas, to strengthen leadership and improve instructional quality. Just 60 percent of families with kids attending can pay fees, making it difficult to retain teachers. This raises the challenge of how to better connect the neighborhood to the city so that residents have easier access to all types of opportunities. The results do not replace the need for the central government to provide basic services, but it does indicate that it is possible to work with the community to reconfigure small spaces for big impact. KDI’s model is slowly changing the lives of residents with small investments and lots of engagement. 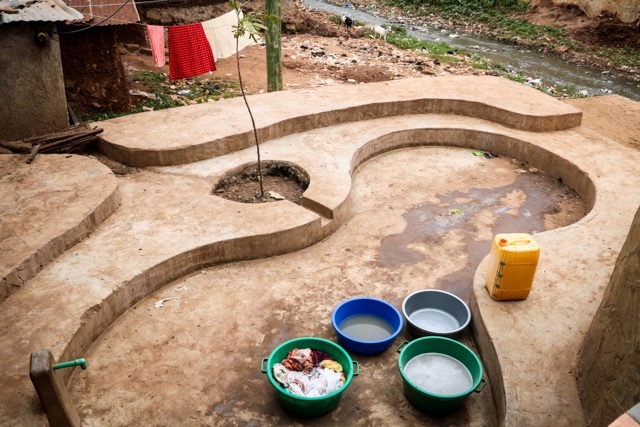 Our visit with the Kounkuey Design Initiative showed us how important and difficult it is to find new ways of upgrading informal spaces that are collaborative, productive and sustainable. KDI’s approach is promising, but also time consuming, raising questions about how we can work together to scale up collaborative design to increase the pace of transformation. Talia Rubnitz is a Communications Assistant for WRI Ross Center for Sustainable Cities.